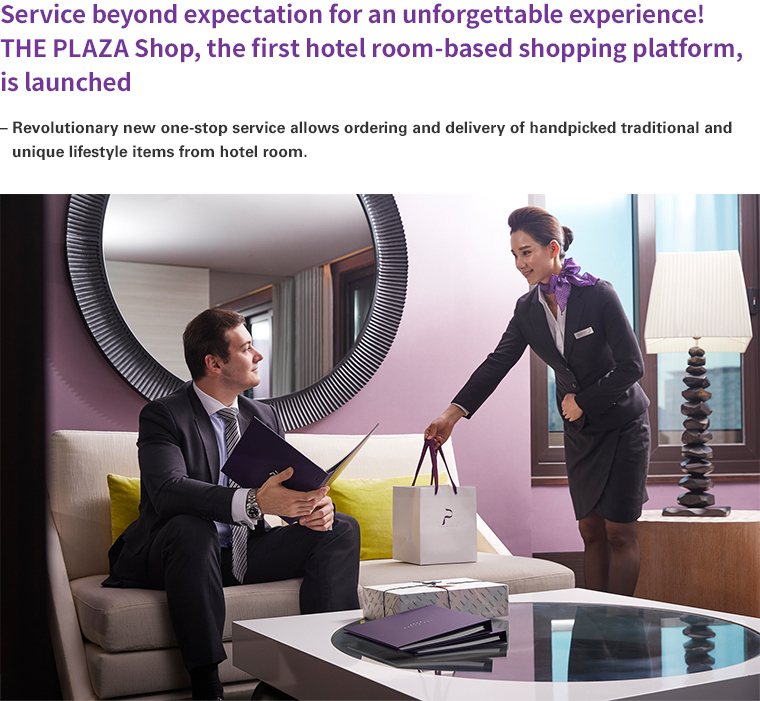 THE PLAZA Seoul, Autograph Collection, the luxury boutique hotel operated by the Hotels Division of Hanwha Hotels & Resorts, announced on November 21 the launch of THE PLAZA Shop. This revolutionary new shopping service, without precedent in the Korean hotel industry, allows guests to order and receive items from a handpicked selection of items in various categories, chosen from the comfort of their own room. THE PLAZA Shop is an exclusive service that reflects THE PLAZA Seoul's commitment to promoting unique and stylish lifestyle values. Going beyond the conventional mini bar concept, it offers a selection of products handpicked by hotel experts, presented in brochure form, that can be ordered and received without leaving the comfort of the room. The brochure features some 20 items in five categories – hotel-branded, Korean traditional, lifestyle, children's and Korean food – offering options for foreign business visitors and tourists alike. At the time of launch, products included in THE PLAZA Shop brochure include P-Collection diffusers with THE PLAZA Seoul's exclusive signature fragrance, premium bath gowns (adult/child), traditional bass cutlery, mother-of-pearl jewelry boxes, naturally dyed scarves, handmade trays, pet items, traditional baby, traditional clothing gift sets, a Sungnyemun Gate model block kit, and a Gopchang roast seaweed set, representing the identities of Korea and THE PLAZA Seoul. The product catalogue will be continuously updated in the future, based on feedback from guest surveys. Meanwhile, the new hotel website (PC/mobile) which is due to go on-line at the end of November, will feature a shopping mall featuring collaborations with top renowned brands. Meanwhile, on November 1, THE PLAZA Seoul introduced Handy, a new hi-tech service featuring a mobile device in all guest rooms offering free information, domestic and overseas phone calls and internet use. The Handy service offers guests direct experience of Korea's advanced IT culture, as well as various information on hotel promotions and offers, and a travel guide , and is proving welcome among hotel guests thanks to the convenience and personalized service it provides.